Dress your desk for success with the Sorbus 5-Piece Desk Organizer Set. Enhance your workspace with zen-like organization! 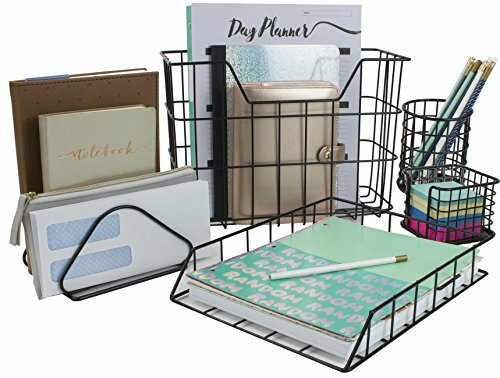 This 5-piece set features a pencil cup holder, letter sorter divider, hanging file organizer, letter tray, and sticky note holder to de-clutter your workstation with style. It keeps everything from papers, files, writing tools, and mail to your favorite notebooks, folders, and magazines neatly organized. As a bonus, the hanging file organizer can be used on your desk or mounted to the wall to free up space. With a sleek aesthetic, this set beautifully complements most décor whether modern, classic, or a rustic. Whether in the home or office, de-clutter any desktop, counter, or dresser with style and efficiency. Bring a modern twist to even the most mundane tasks! Quickly jot your to-do lists, reminders, and love notes with writing materials directly from your pencil cup holder. Organize messages, bills, stationary, and mail using the letter sorter. With three divided sections, it offers total visibility for easy access and sorting. Use the letter tray for documents and files, while keeping keep phone messages, post-it notes, and memos in place with the sticky note holder. As a trendy space-saver, the hanging file organizer basket keeps files, books, magazines, and folders mounted to the wall if needed. The possibilities are endless! Designed for busy Executives, Administrative Staff, Bloggers, Students, Teachers, and more! Made of durable metal with beautiful finish. Round edging along bottom and top rim prevents scratches. Convenient for small spaces.